We've arrived at one of the meatiest SEO topics in our series: technical SEO. In this fifth part of the One-Hour Guide to SEO, Rand covers essential technical topics from crawlability to internal link structure to subfolders and far more. 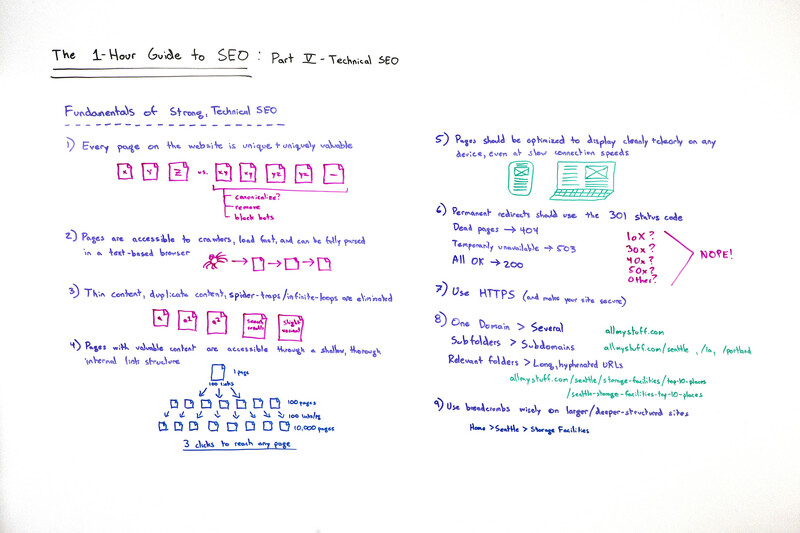 Watch on for a firmer grasp of technical SEO fundamentals! 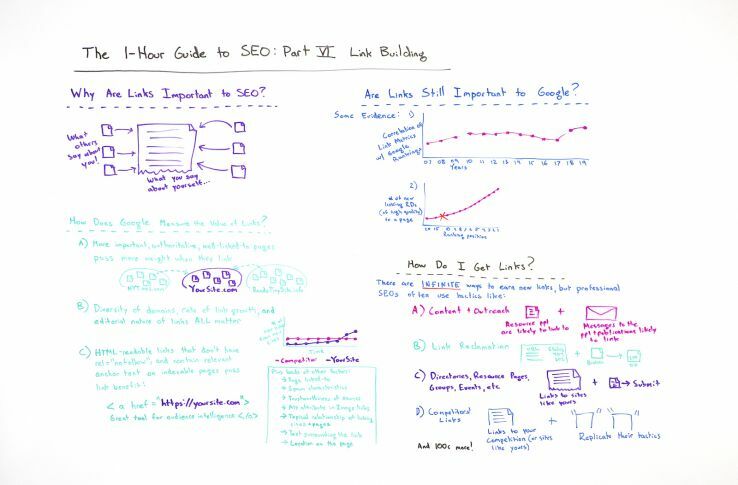 There is no way in the next 10 minutes that I can give you everything that you'll ever need to know about technical SEO, but we can cover many of the big, important, structural fundamentals. So that's what we're going to tackle today. You will come out of this having at least a good idea of what you need to be thinking about, and then you can go explore more resources from Moz and many other wonderful websites in the SEO world that can help you along these paths. First off, every page on a website should be two things — unique, unique from all the other pages on that website, and uniquely valuable, meaning it provides some value that a user, a searcher would actually desire and want. Sometimes the degree to which it's uniquely valuable may not be enough, and we'll need to do some intelligent things. So, for example, if we've got a page about X, Y, and Z versus a page that's sort of, "Oh, this is a little bit of a combination of X and Y that you can get through searching and then filtering this way.Oh, here's another copy of that XY, but it's a slightly different version.Here's one with YZ. This is a page that has almost nothing on it, but we sort of need it to exist for this weird reason that has nothing to do, but no one would ever want to find it through search engines." Okay, when you encounter these types of pages as opposed to these unique and uniquely valuable ones, you want to think about: Should I be canonicalizing those, meaning point this one back to this one for search engine purposes? Maybe YZ just isn't different enough from Z for it to be a separate page in Google's eyes and in searchers' eyes. So I'm going to use something called the rel=canonical tag to point this YZ page back to Z. Maybe I want to remove these pages. Oh, this is totally non-valuable to anyone. 404 it. Get it out of here. Maybe I want to block bots from accessing this section of our site. Maybe these are search results that make sense if you've performed this query on our site, but they don't make any sense to be indexed in Google. I'll keep Google out of it using the robots.txt file or the meta robots or other things. Secondarily, pages are accessible to crawlers. They should be accessible to crawlers. They should load fast, as fast as you possibly can. There's a ton of resources about optimizing images and optimizing server response times and optimizing first paint and first meaningful paint and all these different things that go into speed. Thin content and duplicate content — thin content meaning content that doesn't provide meaningfully useful, differentiated value, and duplicate content meaning it's exactly the same as something else — spider traps and infinite loops, like calendaring systems, these should generally speaking be eliminated. If you have those duplicate versions and they exist for some reason, for example maybe you have a printer-friendly version of an article and the regular version of the article and the mobile version of the article, okay, there should probably be some canonicalization going on there, the rel=canonical tag being used to say this is the original version and here's the mobile friendly version and those kinds of things. If you have search results in the search results, Google generally prefers that you don't do that. If you have slight variations, Google would prefer that you canonicalize those, especially if the filters on them are not meaningfully and usefully different for searchers. Now this is an idealized version. You're probably rarely going to encounter exactly this. But let's say I'm on my homepage and my homepage has 100 links to unique pages on it. That gets me to 100 pages. One hundred more links per page gets me to 10,000 pages, and 100 more gets me to 1 million. So that's only three clicks from homepage to one million pages. You might say, "Well, Rand, that's a little bit of a perfect pyramid structure. I agree. Fair enough. Still, three to four clicks to any page on any website of nearly any size, unless we're talking about a site with hundreds of millions of pages or more, should be the general rule. I should be able to follow that through either a sitemap. If you have a complex structure and you need to use a sitemap, that's fine. Google is fine with you using an HTML page-level sitemap. Or alternatively, you can just have a good link structure internally that gets everyone easily, within a few clicks, to every page on your site. You don't want to have these holes that require, "Oh, yeah, if you wanted to reach that page, you could, but you'd have to go to our blog and then you'd have to click back to result 9, and then you'd have to click to result 18 and then to result 27, and then you can find it." No, that's not ideal. That's too many clicks to force people to make to get to a page that's just a little ways back in your structure. Permanent redirects. So this page was here. Now it's over here. This old content, we've created a new version of it. Okay, old content, what do we do with you? Well, we might leave you there if we think you're valuable, but we may redirect you. If you're redirecting old stuff for any reason, it should generally use the 301 status code. If you have a dead page, it should use the 404 status code. You could maybe sometimes use 410, permanently removed, as well. Temporarily unavailable, like we're having some downtime this weekend while we do some maintenance, 503 is what you want. Everything is okay, everything is great, that's a 200. All of your pages that have meaningful content on them should have a 200 code. These status codes, anything else beyond these, and maybe the 410, generally speaking should be avoided. There are some very occasional, rare, edge use cases. But if you find status codes other than these, for example if you're using Moz, which crawls your website and reports all this data to you and does this technical audit every week, if you see status codes other than these, Moz or other software like it, Screaming Frog or Ryte or DeepCrawl or these other kinds, they'll say, "Hey, this looks problematic to us. You should probably do something about this." When you are building a website that you want to rank in search engines, it is very wise to use a security certificate and to have HTTPS rather than HTTP, the non-secure version. Those should also be canonicalized. There should never be a time when HTTP is the one that is loading preferably. Google also gives a small reward — I'm not even sure it's that small anymore, it might be fairly significant at this point — to pages that use HTTPS or a penalty to those that don't. In general, well, I don't even want to say in general. It is nearly universal, with a few edge cases — if you're a very advanced SEO, you might be able to ignore a little bit of this — but it is generally the case that you want one domain, not several. Allmystuff.com, not allmyseattlestuff.com, allmyportlandstuff.com, and allmylastuff.com. Why is this? Google's representatives have sometimes said that it doesn't really matter and I should do whatever is easy for me. I have so many cases over the years, case studies of folks who moved from a subdomain to a subfolder and saw their rankings increase overnight. Credit to Google's reps. I'm sure they're getting their information from somewhere. But very frankly, in the real world, it just works all the time to put it in a subfolder. I have never seen a problem being in the subfolder versus the subdomain, where there are so many problems and there are so many issues that I would strongly, strongly urge you against it. 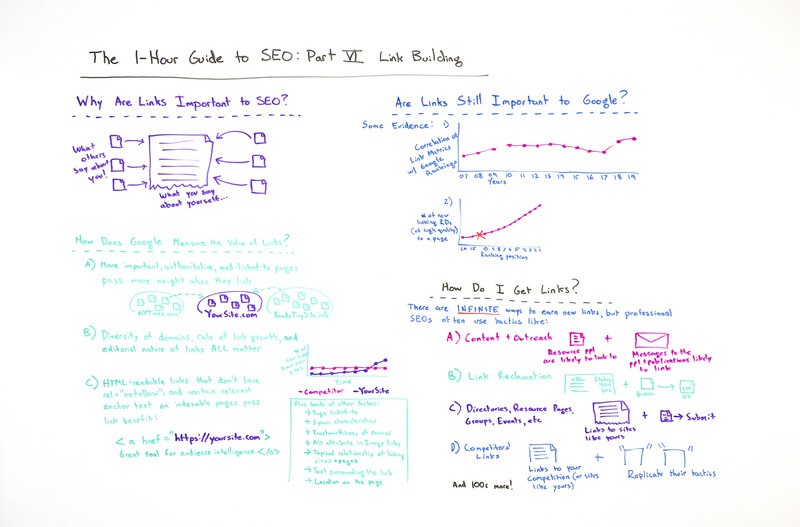 I think 95% of professional SEOs, who have ever had a case like this, would do likewise. Relevant folders should be used rather than long, hyphenated URLs. This is one where we agree with Google. Google generally says, hey, if you have allmystuff.com/seattle/ storagefacilities/top10places, that is far better than /seattle- storage-facilities-top-10-places. It's just the case that Google is good at folder structure analysis and organization, and users like it as well and good breadcrumbs come from there. There's a bunch of benefits. Generally using this folder structure is preferred to very, very long URLs, especially if you have multiple pages in those folders. Last, but not least, at least last that we'll talk about in this technical SEO discussion is using breadcrumbs wisely. So breadcrumbs, actually both technical and on-page, it's good for this. Google generally learns some things from the structure of your website from using breadcrumbs. They also give you this nice benefit in the search results, where they show your URL in this friendly way, especially on mobile, mobile more so than desktop. They'll show home > seattle > storage facilities. Great, looks beautiful. Works nicely for users. It helps Google as well. To help convince your boss that won't just be lounging pool-side, sipping cocktails on the company dime, we’ve gathered the goods to help you get your boss to greenlight your MozCon attendance. You work hard taking notes, learning new insights, and digesting all of that knowledge — that’s why we think you deserve a little fun in the evenings. 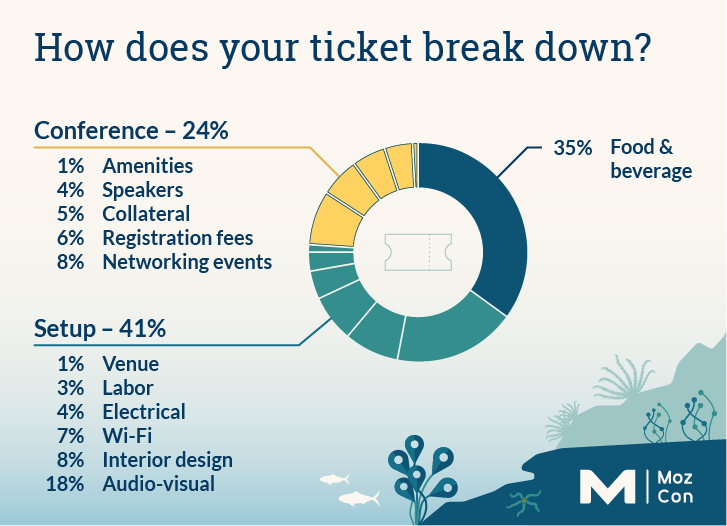 It's your chance to decompress with fellow attendees and make new friends in the industry. We host exciting evening networking events that add to the value you'll get from your day of education. Plus, our Birds of a Feather lunch tables allow you to connect with like-minded peers who share similar interests. I'm convinced, now grab my ticket! MozCon is one unforgettable experience that lives and grows with you beyond just the three days you spend in Seattle. And there's no time like the present to pitch MozCon to your boss. If they're still stuck on the "why", let them know about our subscriber or group pricing tiers to your boss — you’ll save hundreds of dollars when you do. Just think of all the Keurigs you could get for that communal kitchen! MozCast showed a multi-day increase in temperatures, including a 105° spike on April 6. 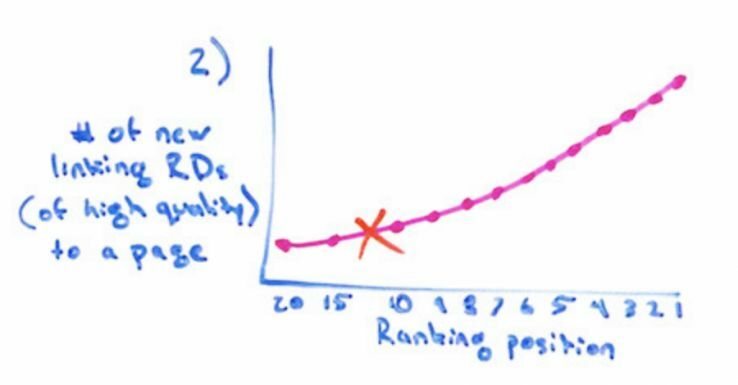 While deindexing would naturally cause ranking flux, as pages temporarily fell out of rankings and then reappeared, SERP-monitoring tools aren't designed to separate the different causes of flux. Google's own tools can help us check whether a page is indexed, but doing this at scale is difficult, and once an event has passed, we no longer have good access to historical data. 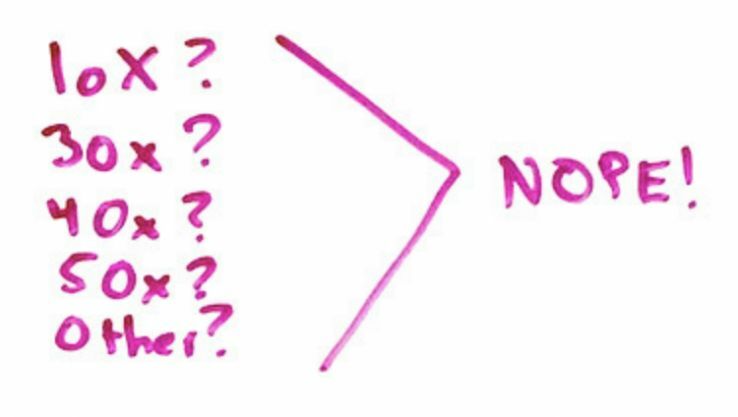 What if we could isolate a set of URLs, though, that we could reasonably expect to be stable over time? Could we use that set to detect unusual patterns? Since MozCast only tracks page one, I wanted to reduce noise from a URL "falling off" from, say, position #9 to #11. Using these qualifiers, I was left with a set of 23,237 "stable" URLs. 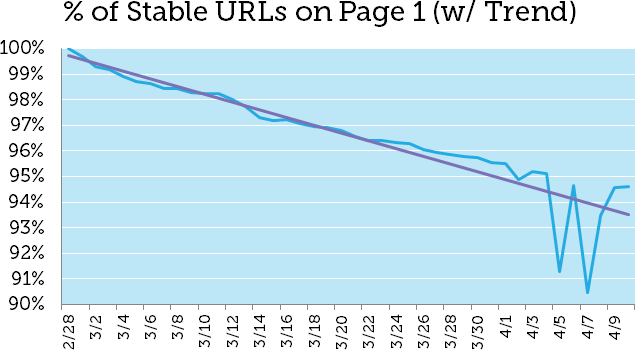 So, how did those URLs perform over time? Since all of the URLs in the set were stable throughout February, we expect 100% of them to appear on February 28 (which the graph bears out). The change over time isn't dramatic, but what we see is a steady drop-off of URLs (a natural occurrence of changing SERPs over time), with a distinct drop on Friday, April 5th, a recovery, and then a similar drop on Sunday, April 7th. 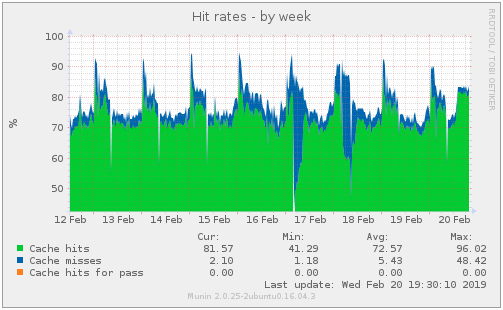 Note that this metric moved very little during March's algorithm flux, including the March "core" update. 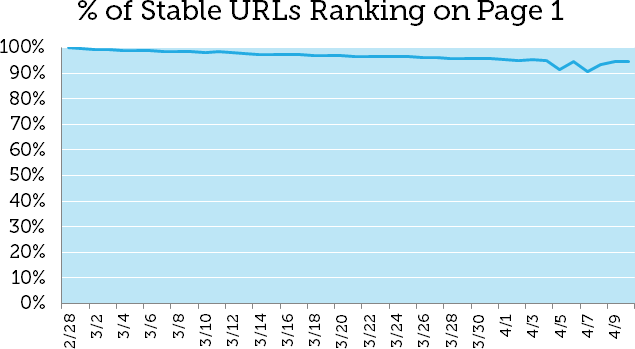 We can't prove definitively that the stable URL drop cleanly represents deindexing, but it appears to not be impacted much by typical Google algorithm updates. It's difficult to determine whether this bug was random, affecting all sites somewhat equally, or was systematic in some way. 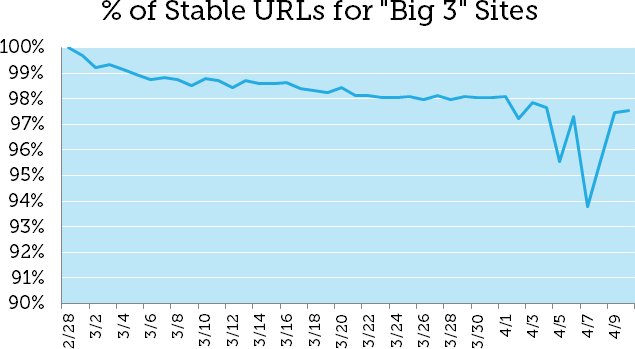 It's possible that restricting our analysis to "stable" URLs is skewing the results. 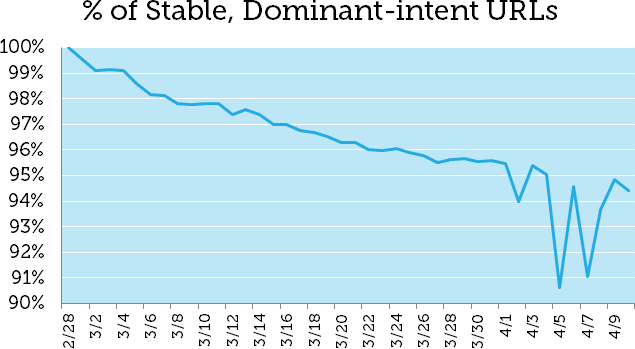 On the other hand, trying to measure the instability of inherently-unstable URLs is a bit nonsensical. I should also note that the MozCast data set is skewed toward so-called "head" terms. It doesn't contain many queries in the very-long tail, including natural-language questions. At the same 90–100% zoomed-in scale, you can see that the impact was smaller than across all stable URLs, but there's still a clear pair of April 5th and April 7th dips. It doesn't appear that these mega-sites were immune. Is this over, and what's next? As one of my favorite movie quotes says: "There are no happy endings because nothing ever ends." For now, indexing rates appear to have returned to normal, and I suspect that the worst is over, but I can't predict the future. If you suspect your URLs have been deindexed, it's worth manually reindexing in Google Search Console. Note that this is a fairly tedious process, and there are daily limits in place, so focus on critical pages. The impact of the deindexing bug does appear to be measurable, although we can argue about how "big" 4% is. For something as consequential as sites falling out of Google rankings, 4% is quite a bit, but the long-term impact for most sites should be minimal. For now, there's not much we can do to adapt — Google is telling us that this was a true bug and not a deliberate change.